Sound On Sound magazine's mix specialist Mike Senior shows you how to achieve release-quality mixes even in the smallest studios, by applying power-user techniques from the world's most successful producers. Mixing Secrets For The Small Studio is a down-to-earth primer for small-studio enthusiasts who want chart-ready sonics in a hurry. Drawing on the back-room strategies of more than 100 famous names, this entertaining guide leads you step-by-step through the entire mixing process. On the way, you'll unravel the mysteries of every type of mix processing, from simple EQ and compression through to advanced spectral dynamics and 'fairy dust' effects. User-friendly explanations introduce technical concepts on a strictly need-to-know basis, while chapter summaries, assignments, and extensive on-line resources are perfect for school and college use. Learn the subtle editing, arrangement, and monitoring tactics which give industry insiders their competitive edge, and master the psychological tricks which protect you from all the biggest rookie mistakes. Find out where you don't need to spend money, as well as how to make a limited budget really count. "A definite must-read for everyone involved in music production at any level." "This book is gold... may bump your work forward by months or years." "A huge must-have... I cannot recommend it more." "Highly recommended.. the book is filled with so much great stuff." "Fantastic book on audio mixing." "Outstanding... this book is dynamite." "The Bible for small recording studios." 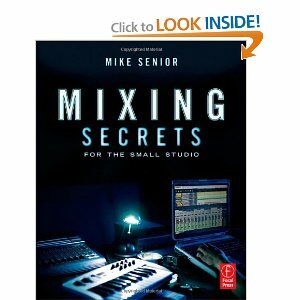 "Best resource on mixing, hands down." "The mixing education I've been searching for." 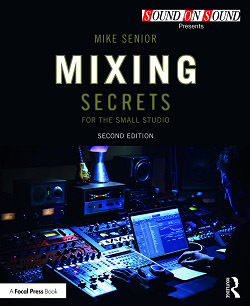 The book's extensive accompanying on-line resource pages provide hundreds of in-depth audio demonstration files, the unrivalled 'Mixing Secrets' Free Multitrack Download Library for mixing practice, detailed budget-friendly hardware/software recommendations (including the Mixing Secrets Freeware Top Ten), and lots of links to further reading. Mike Senior is a professional engineer who has worked with Wet Wet Wet, The Charlatans, Reef, Therapy, and Nigel Kennedy. He specialises in adapting the techniques of top producers for those working on a budget. Since 2007 he has transformed dozens of amateur productions for Sound On Sound magazine's popular 'Mix Rescue' column, proving time and again that you can achieve commercial-grade results with affordable gear — once you know how! Purchase direct from Focal Press with promo code 'FLR40' for a 20% discount!